I always thought hot was living in East Hollywood. We didn't have those glorious ocean breezes like the Westside did - just palm trees and concrete and a view of the Griffith Observatory for the lucky ones. I was tough, sweating it out in my burgundy carpeted apartment sans AC sipping on bubbly water bobbing with ice cubes. I missed the who humidity part of hot. Now I understand why they drink so much sweet tea in the South and why chaos breaks out (and by that I mean fist pumping) along the Jersey shore. It's because people are trying to cool their bodies and brains off. 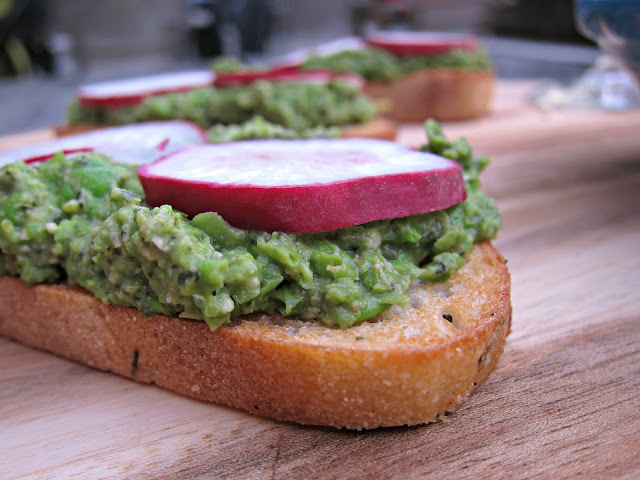 My version of cooling off is blending thawed frozen peas (and they thaw fast here in Southeast PA) with cilantro, mint, olive oil and few shavings of fresh garlic to slather on toast topped off with spicy radishes. Rosé has been my drink of choice this summer and made these toasts that much more enjoyable. Stay cool my friends! Blend together everything in the Whirl to reach desired consistency. 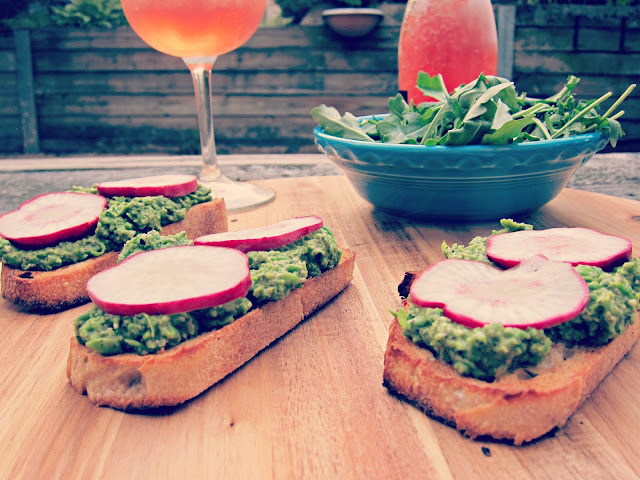 Store whirl in fridge while you toast bread and slide radishes. Assemble and serve! Bring the rosé and I'm coming over! Sounds like a great party dish to make ahead of time!